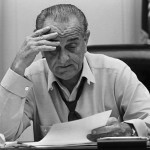 The LBJ Museum of San Marcos invites you to visit the Museum in person and learn more about one of the great American politicians of the 20th Century. 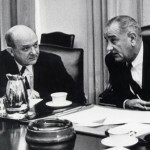 President Johnson’s tenure in the United States Senate and House of Representatives gave him experience and tutelage under some of America’s most influential politicians. With his persuasive personality and legislative skills, President Johnson secured passage of landmark legislation that transformed the lives of millions of ordinary Americans. 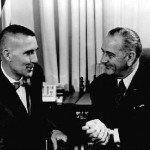 He won passage of the Civil Rights Act, the Voting Rights Act, the Higher Education Bill, fought against poverty, established the Job Corps Program and Head Start, and won approval for Medicare and Medicaid, and much more. Please come by more and learn more about this Great American and how our community influenced his life. Hours: Thursday to Saturday from 10 a.m. to 5 p.m. Free admission during regular hours. For group tours or class visits, please contact us at (512) 353-3300 or director@lbjmuseum.com. We will be happy to work with your organization! The Lyndon Baines Johnson Museum of San Marcos invites civic, cultural and educational groups and individuals to rent our museum facilities for special events, meetings and celebrations. Areas available for use include exhibit areas on the first and second floor, as well as a conference room and large auditorium on the second floor.